As I write these words, New Horizons is cruising through the cold vacuum of space, almost three billion miles from Earth, still in hibernation and awaiting wakeup during the first week of December. 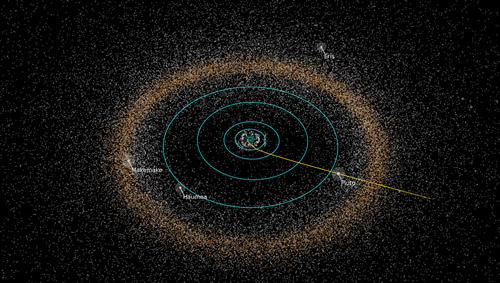 Last week, we were able to announce that, for the first time, we have located small, ancient Kuiper Belt Objects (KBOs) that New Horizons can reach with the fuel we expect to have onboard after we complete the Pluto mission. This is big news! In fact, it’s historic news, because it means that humankind now has the capability — for the first time — to explore KBOs. You might be wondering, what is the big deal about KBOs? 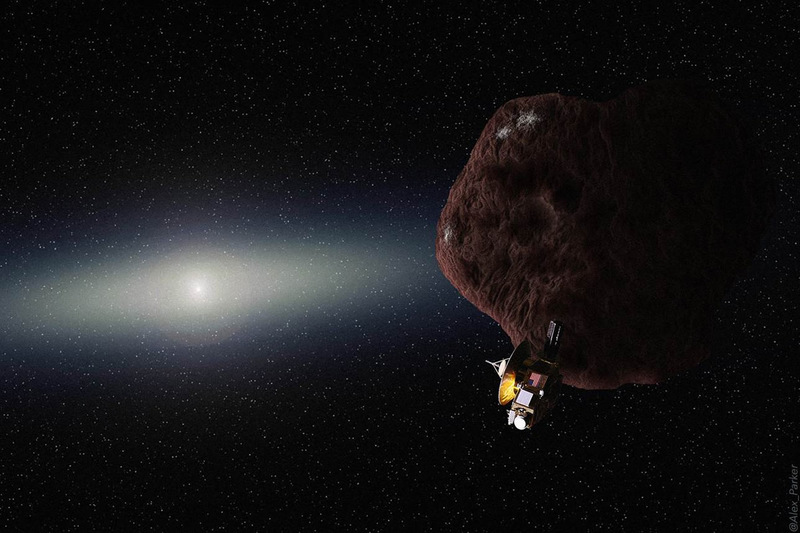 Well, one big deal is that the U.S. National Academy of Sciences ranked the exploration of Kuiper Belt Objects to be its highest priority objective for NASA’s New Frontiers program, in which New Horizons resides. In fact, the academy emphasized this priority by referring to our mission as a “Kuiper Belt-Pluto” mission — meaning that the Kuiper Belt context was ranked above the exploration of Pluto. Why? Simply put, it’s because KBOs, being much smaller than Pluto, but having been kept in the essentially timeless deep freeze beyond Pluto for four billion-plus years, offer a lot of information about the origin of our solar system and the planets, including Kuiper Belt planets like Pluto, Eris, Makemake and others. 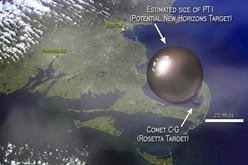 The exploration of small KBOs beyond Pluto – shown mostly as a "ring" in this illustration – has been a major goal of the New Horizons mission since its design phase, more than a dozen years ago. So when we designed New Horizons, we included the capability for it to fly beyond the Pluto system for many years and to explore KBOs as far as another two billion miles from the Sun. 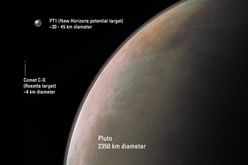 This meant, for example, sizing the fuel tank to carry extra hydrazine for a flyby, making the communications system capable of working from far beyond Pluto, increasing the reliability of the spacecraft design and parts to carry out a years-long KBO mission after Pluto, and designing scientific instruments that can work in light levels even lower than the dim sunlight at Pluto. But because the National Academy of Sciences directed us to fly by small KBOs (just 20 to 50 kilometers across) — which are more likely to be primitive bodies, less well-formed than planets like Pluto — we had to search for exceptionally faint and very hard-to-find KBOs. In fact, back then, no such KBOs had even been discovered. So our team had to undertake a dedicated, state-of-the-art search for small KBOs we could reach. We began this work in 2002 with preliminary studies of how to do a search, and some test observations that continued in 2003 and 2004 as we explored appropriate search techniques for such small, far away bodies. Those studies showed that, because Pluto is currently orbiting against the dense star fields of Sagittarius — the galactic center — it would be best to wait until 2011 when the search areas we needed to plumb began to move into slightly less crowded portions of the sky. So beginning in 2011, and continuing in 2012 and 2013, our KBO search team — led by planetary astronomer and New Horizons mission co-investigator John Spencer of the Southwest Research Institute — wrote proposals to most of the world’s largest telescopes to garner search time. After winning that search time, they made more than 15 search runs at telescopes including the Keck, Magellan, Gemini and Subaru, and then developed custom software to detect the very faint, slowly moving KBOs we were seeking. While those searches search found more than 50 faint KBOs against the star fields of Sagittarius, none, unfortunately, were targetable within the fuel supply of New Horizons. Watch the New Horizons team search for KBOs from the "top of the world"
When we realized that ground-based techniques were not likely to achieve success before the Pluto flyby, we took the extraordinary step of applying this year for a large amount of time on the even-more-sensitive Hubble Space Telescope that NASA operates in Earth orbit. In June, we were awarded that observing time, and the Hubble project worked with us to swing the telescope into action within about three days! Over the next two months, we blanketed the KBO search region with Hubble images that detected significantly fainter objects than what we had achieved with large ground-based telescopes. At the same time, Spencer and his search team wrote more customized software to reduce and analyze the Hubble data. In my estimation, this team, working night and day, seven days a week, did about a year’s worth of work between June and September. The result: Hubble had come to the rescue! In total, we found five candidate KBOs that would pass relatively near our post-Pluto trajectory, each about 100,000 times fainter than Pluto. Additional Hubble observations then refined the orbits of all five. From those data, two of the five turned out to require too much fuel to reach; another two were determined to be possibly reachable but needed still more observing; and one KBO was found to be easily targetable—requiring only about 60% or less of our onboard post-Pluto fuel. This illustration shows how the Hubble Space Telescope canvassed the New Horizons KBO search region of the sky to detect targets we can fly by in 2018 or 2019. 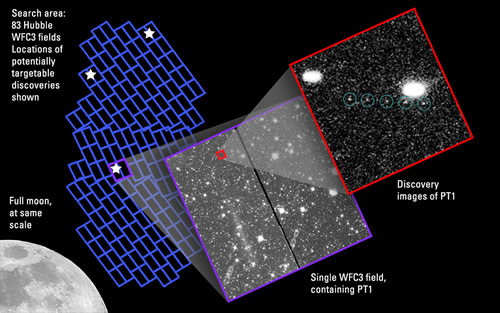 Hubble discovery images of "PT1" – or Potentially Targetable KBO 1. We’re now tracking all three of the remaining Hubble KBO candidates, refining their orbits and their brightness. The one we call “PT1”— for Potentially Targetable KBO 1 — is the faintest and smallest of the three, but it’s the one we can definitely reach. PTs 2 and 3 are a bit brighter, making them more attractive as targets because we not only have to home in on them, but because they are also likely to be larger, they are more scientifically interesting. All three are in the range of 20-55 kilometers across, and all three have possible flyby dates in late 2018 or in 2019 — a billion miles beyond Pluto. What comes next? We’ll continue to refine the orbits of these three faint Hubble KBOs, and we’ll look to determine more about them too — such as their rotation periods, colors, and whether any have moons we can detect. Then late next summer, after the Pluto flyby, we’ll work with NASA to choose the best candidate among the three. Next, in fall 2015, we will fire the engines aboard New Horizons – at the optimal time to minimize the fuel required to reach our selected target – to begin the journey. Then, like all NASA missions that have finished their main objective but seek an extension to do more exploration, we will write a proposal to NASA to fund the KBO mission. That proposal will be due in 2016 — knowing we are safely on course there. Our proposal will be evaluated by an independent team of experts to gauge its merit: the team will evaluate the health of the spacecraft and its instrument payload, the value of the science we can do at the KBOs, the cost of the flight to and the exploration of the target KBO, and more. If it recommends funding and NASA approves, the New Horizons Extended Mission would begin in 2017, allowing us to plan and test the encounter (which would take place one-two years later) and to continue to operate New Horizons. I hope that all that comes to pass. But for now, I am ecstatic just to have targets we can propose to fly by, and grateful to the Hubble project and the Spencer-led KBO search team for all the hard work and dedication both put into the historic achievement of finding targetable KBOs for exploration. We're using Hubble Space Telescope to track three possible KBO targets, each requiring New Horizons to fly a different course after Pluto. Which one we choose will only be decided late next summer, after the Pluto flyby. The KBO flyby targets we have found are very small compared to Pluto, itself almost 2,500 kilometers in diameter, but they are much larger than comets like the one ESA's Rosetta mission is now orbiting. Their intermediate size adds to these KBOs' scientific value. 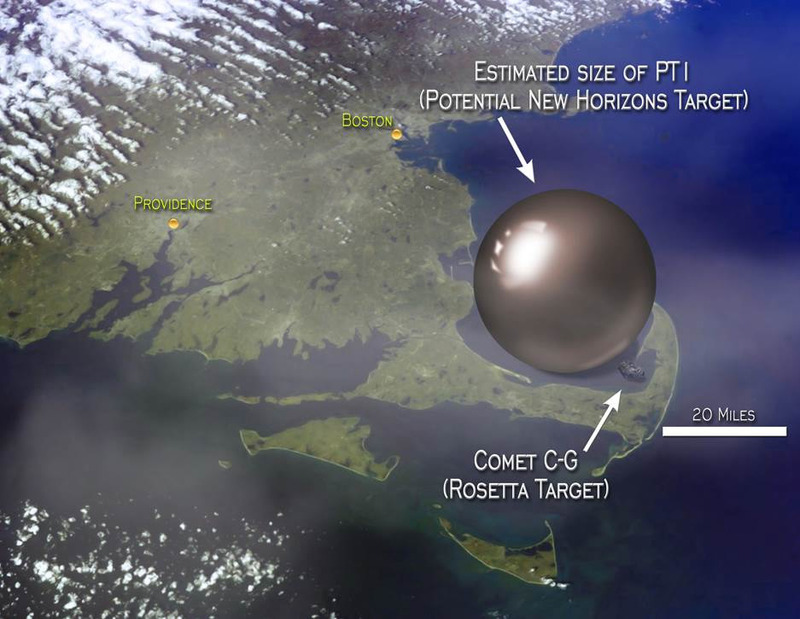 The illustrations here show that comparison, as well as a comparison of comets to our target KBOs against the Eastern seaboard of the United States. 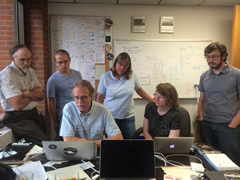 As I told John’s search team, if the 20th century astronomers who painstakingly searched for Pluto—like Percival Lowell and Clyde Tombaugh—were alive today, they would be very proud of the still much-harder task that our KBO search team accomplished almost a century later. They would be even more amazed that the search to find them was carried out by a telescope in space—because nothing like that capability was even imagined when they were searching for Pluto. But, I believe, Lowell and Tombaugh would be even more amazed that the purpose of the search for these KBO was to send a machine to explore them! Humankind is capable of many amazing things, including the exploration of space. What possesses us to be curious about nature? What is at the root of our yearning to explore? Why do we strive so hard to know about the universe that surrounds us? Those are questions we can’t fully answer, but in my view, these attributes are an important part of what makes humans such a special species. As proud as I am to be the leader of New Horizons and to have such dedicated, hard working, and talented scientists as those on the HST search team (and many others) on New Horizons, I am even more proud to be part of a species that has such a drive to explore. So until I write again later this year, I hope you’ll keep exploring — just as we do! 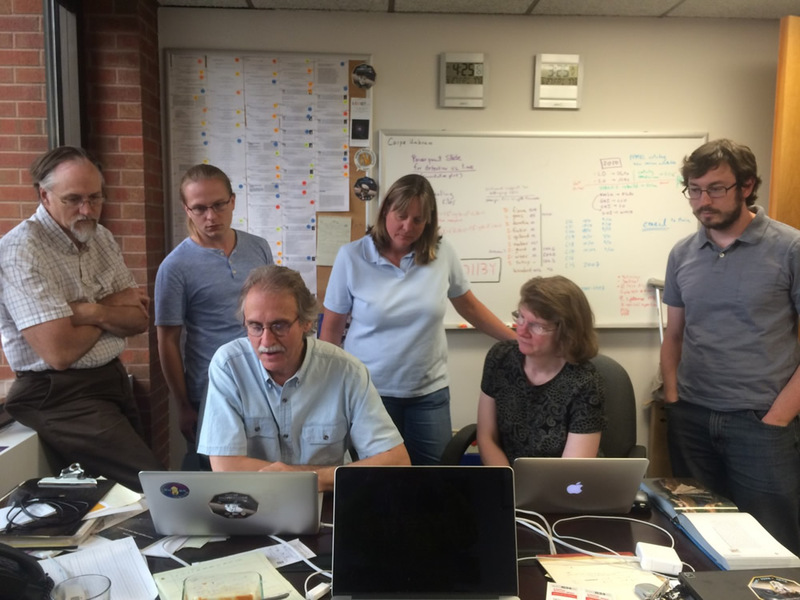 The New Horizons KBO search team that John Spencer leads consists of the following talented and dedicated scientists, listed alphabetically: Susan Benecchhi/PSI, Mike Belton/Retired, Gary Bernstein/U. Penn., David Borncamp/Space Telescope Science Institute, Marc Buie/SwRI, Cesar Fuentes/Northern Arizona University, Stephen Gwyn/Herzberg Institute of Astrophysics, J.J. Kavelaars/ Herzberg Institute of Astrophysics , Max Mutchler/Space Telescope Science Institute, Keith Noll/NASA Goddard Space Flight Center, Alex Parker/SwRI, Simon Porter/SwRI, Jean-Marc Petit/Obs. De Besancon, Eric Schindhelm/SwRI, Mark Showalter/SETI, Kelsi Singer/SwRI, Ray Sterner/ Johns Hopkins Applied Physics Lab, Dave Tholen/U. Hawaii, Anne Verbiscer/U. Virginia, Hal Weaver/Johns Hopkins Applied Physics Lab, and Amanda Zangari/SwRI. The following dedicated and talented scientists made significant contributions to the ground-based KBO search effort, going back to 2004: Rick Binzel/MIT, Francesca DeMeo/MIT, Hisanori Furusawa/National Astronomical Observatory of Japan, Tetsuharu Fuse/National Astronomical Observatory of Japan, Pamela Gay/Southern Illinois University, Amanda Gulbis/South African Astrophysical Observatory, Hiroshi Karoji/Univ. Tokyo, Daisuke Kinoshita/National Central University, Taiwan, Satoshi Miyazaki/National Astronomical Observatory of Japan, Brian McLeod/CfA, Noemi Pinilla-Alonso/Univ. Tennessee, David Osip/Las Campanas Observatory, Joel Parker/SwRI, Darin Ragozzine/CfA, Scott Sheppard/Carnegie Institution of Washington, Andrew Steffl/SwRI, Akito Tajitsu/National Astronomical Observatory of Japan, Tsuyoshi Terai/National Astronomical Observatory of Japan, David Trilling/Northern Arizona University, Larry Wasserman/Lowell Observatory, Takuya Yamashita/ National Astronomical Observatory of Japan, Toshifumi Yanagisawa/JAXA, Fumi Yoshida/National Astronomical Observatory of Japan.